This volume collects almost two decades of joint work of Sergiu Hart and Andreu Mas-Colell on game dynamics and equilibria. The starting point was the introduction of the adaptive strategy called regret-matching, which on the one hand is simple and natural, and on the other is shown to lead to correlated equilibria. This initial finding - boundedly rational behavior that yields fully rational outcomes in the long run - generated a large body of work on the dynamics of simple adaptive strategies. In particular, a natural condition on dynamics was identified: uncoupledness, whereby decision-makers do not know each other's payoffs and utilities (so, while chosen actions may be observable, the motivations are not). This condition turns out to severely limit the equilibria that can be reached. Interestingly, there are connections to the behavioral and neurobiological sciences and also to computer science and engineering (e.g., via notions of "regret"). 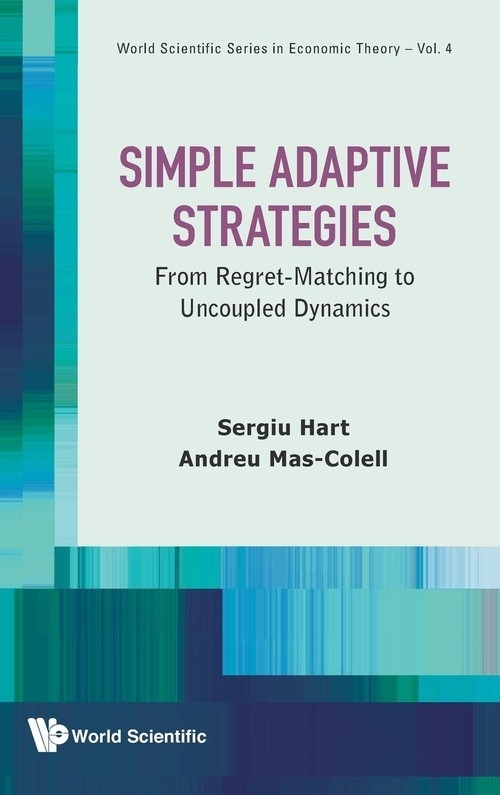 "Simple Adaptive Strategies" is self-contained and unified in its presentation. Together with the formal treatment of concepts, theorems, and proofs, significant space is devoted to informal explanations and illuminating examples. It may be used for advanced graduate courses - in game theory, economics, mathematics, computer science, engineering - and for further research.Correlated Equilibria: Existence of Correlated Equilibria (Sergiu Hart and David Schmeidler); Regret Matching: A Simple Adaptive Procedure Leading to Correlated Equilibrium (Sergiu Hart and Andreu Mas-Colell); A General Class of Adaptive Strategies (Sergiu Hart and Andreu Mas-Colell); A Reinforcement Procedure Leading to Correlated Equilibrium (Sergiu Hart and Andreu Mas-Colell); Regret-Based Continuous-Time Dynamics (Sergiu Hart and Andreu Mas-Colell); General Procedures Leading to Correlated Equilibria (Amotz Cahn); Uncoupled Dynamics: Uncoupled Dynamics Do Not Lead to Nash Equilibrium (Sergiu Hart and Andreu Mas-Colell); Stochastic Uncoupled Dynamics and Nash Equilibrium (Sergiu Hart and Andreu Mas-Colell); Uncoupled Automata and Pure Nash Equilibria (Yakov Babichenko); How Long to Equilibrium? The Communication Complexity of Uncoupled Equilibrium Procedures (Sergiu Hart and Yishay Mansour); Dynamics and Equilibria: Adaptive Heuristics (Sergiu Hart); Nash Equilibrium and Dynamics (Sergiu Hart).